Suzuki have revealed their big, new, retro bruiser, the GSX-S1000-based Katana, will cost £11,399 when it arrives in dealers in late April. We've already ridden it on the launch, and now we're looking forward to one joining the MCN Fleet in a few months. Read on for the full story, right from the beginning. The new Kat marks a bold return to the range for one of the firm’s most well-known models, and marks the first indication of Suzuki’s desire to draw upon their glory days with a rumoured return of the DR BIG in 2020, too. The new Katana is clearly styled to mimic its ancestor. With a chiselled nose, chunky square headlamp and shallow tank profile, it’s an unapologetic homage to the 1981 original, but there’s nothing out-dated about it. The 148bhp powerplant is shared with the GSX-S1000, with dual throttle valves, a 44mm throttle body (like its GSX-R1000 sibling), and 10-hole injectors for precise atomisation. The GSX-S was originally plagued by snatchy fuelling that boasted all the subtlety of a light switch, but progressive improvements have dialled out most of those problems in subsequent model revisions so we’re hopeful the new Katana will be as smooth on the throttle as its nose is sharp. Our first ride, which is happening right now in Japan, will reveal all. 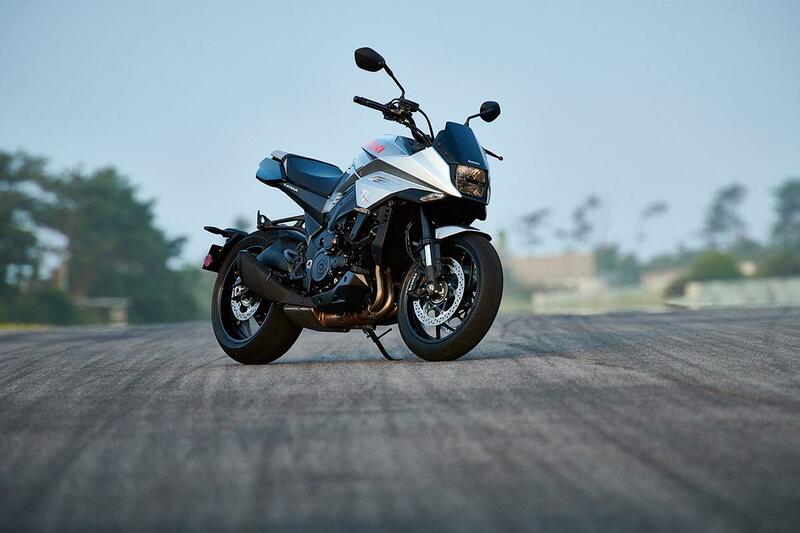 Full 2019 Suzuki Katana review here. What we also already know is that it boasts three-mode traction control, a slipper clutch for those focused rides, ABS-enabled Brembo radial calipers, low rpm assist and a new, full LCD dash that’s very similar to the GSX-R1000R’s (and equally different from that of the GSX-S). Lighting is LED all round and the suspension comprises 43mm inverted, fully-adjustable, KYB forks and preload/rebound adjustable shock. Wheels are Y-spoke, cast rims rolling on Dunlop Roadsport 2 rubber (120/70 R17 front and 190/50 R17 rear). Suzuki have also announced a somewhat comically-named Samurai Accessory Pack for £999 comprising a fly screen, red/black seat, carbon effect mudguard, engine covers, tank pad, wheel rim tape and red fairing and seat unit decal. The kit represents a £383 saving over buying individual parts and comes in both colour options. If the new Katana still doesn’t quite have enough 80s kitsch about it for your tastes, fear not. For a few dollars more you can pimp it out with blood-red Brembo calipers, carbon fibre engine case covers, a smoked screen, or red-flanked Katana logoed seat, heated grips, tanks and fuel cap protectors, and rim decals. We expect bikes in dealers by late April. Get your deposit down, and dust off your Simpson Bandit. Suzuki unveiled a new colour for their 2019 Katana at EICMA 2018 in Milan. The black paintjob version of the modern retro will be made available alongside the classic silver version in 2019. The Japanese firm may not have been lavishing a great number of new bikes on us over recent years, but we’re very pleased they’ve been brave enough to sell this one in 2019. If you want to be critical, then you could just say it’s a dressed up Suzuki GSX-S1000, but what’s wrong with that? 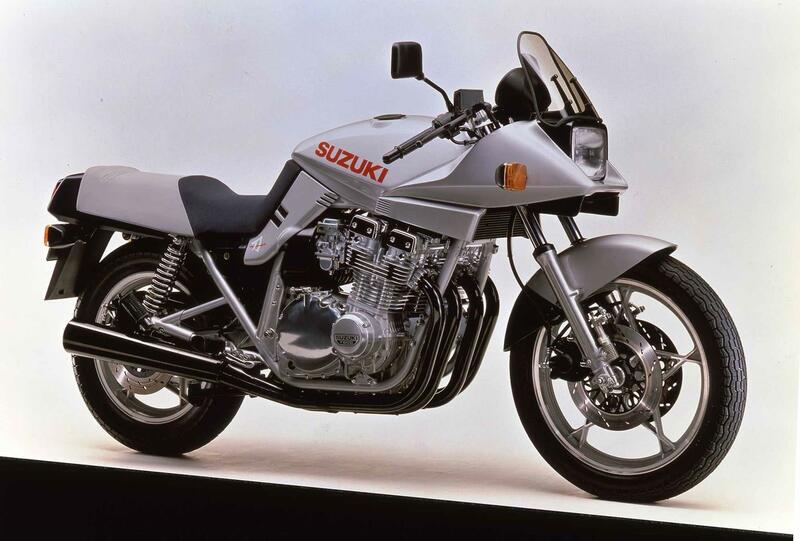 After all, let’s not forget that the original Katana from way back in 1981 was just a boldly dressed GSX1100E. Let’s also not forget that the GSX-S1000 is actually a rather good bike that’s slipped under most peoples’ radar simply because it’s not bold enough to stand out. But you couldn’t accuse the new Katana of such coyness. You might wonder where it’s supposed to fit into the market, and the answer being that it’s a sporty street bike that has more in common with a naked than it does with faired superbikes – but it’s primary focus is to provide you with a comfortable everyday bike and weekend bruiser that hasn’t been whacked with the wand of mediocrity. The only obvious demerit in this attractive retro is the lack of fuel capacity, with the short and slim tail unit, and low-profile tank presumably causing a packaging nightmare that has squeezed the tank capacity down a miserly 12 litres. We’ll forgive that minor annoyance though because it simply gives another chance to see yourself on it reflected in the filling station windows. It’s certainly a homage, rather than a replica, but this retro bruiser is anything but bland. The firm nods to its ancestor’s chiselled nose, square headlamp and hunched flanks that wrap around the shallow profiled tank and end in less chunky haunches are all clear to see. The fact that Suzuki have used the 37-year-old font for the tank logo is a lovely touch, too. 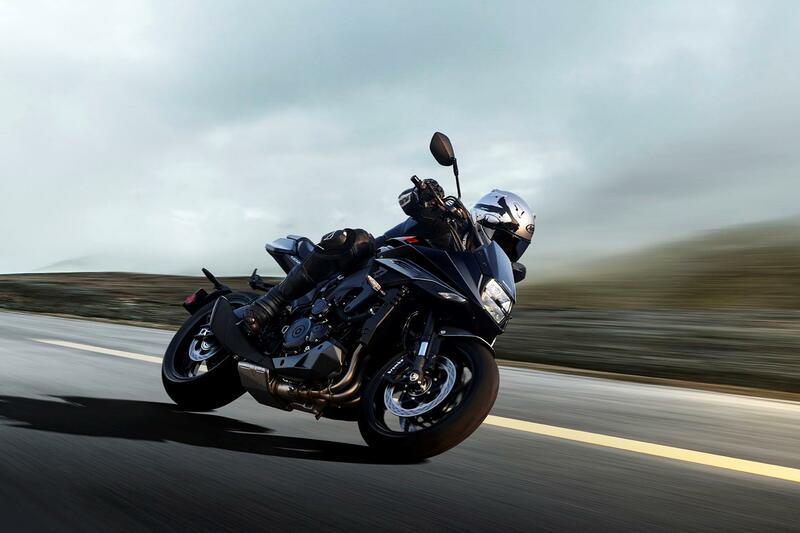 The pre-production Suzuki Katana, which you may have seen at the London Motorcycle Show in February, is undergoing a tour of Suzuki dealers around the UK. 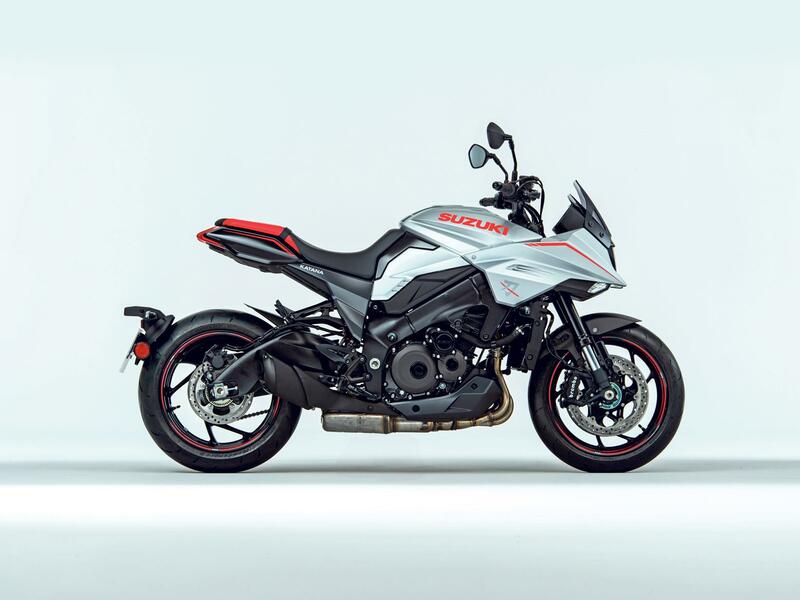 It was displayed at the Scottish Motorcycle Show from March 9-10 before it carried on to almost every Suzuki franchise, finishing up in Doncaster in May. The new Katana borrows design cues from the 1981 version but is based on the current Suzuki GSX-S1000 with the engine from a 2005 GSX-R1000. 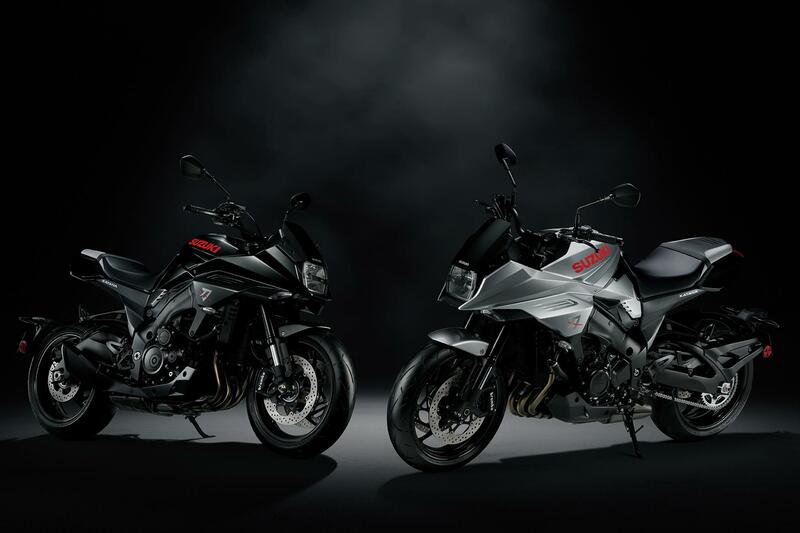 The differences between the Suzuki Katana and the GSX-S1000 are more than skin deep, with updates to the riding position, electronics, dash interface and 43mm inverted fully adjustable KYB fork and preload/rebound adjustable shock. If the Katana is coming anywhere near you, why not have a ride over with some mates for a look? Every little helps towards your #ride5000milestotal after all! Suzuki’s unveiling of the 2019 Katana at Intermot was a launch that divided opinion, with hundreds of thousands of people engaged in a global discussion surrounding its styling, features and whether Suzuki were right to resurrect such an iconic name ahead of next year. Launched at Intermot exactly 38 years earlier in 1980, the original bike was a radically-styled cutting-edge sports machine, capable of around 150mph. This new bike, unsurprisingly, takes development further. It is based on the current Suzuki GSX-S1000 and uses a reworked 2005 GSX-R1000 engine housed within a cast aluminum frame and suspended on adjustable front and rear springs. Despite its obvious similarities with the GSX-S, the new Kat is more than a simple cosmetic job and to find out exactly how it differs, MCN sat down with Suzuki test rider Jurgen Plaschka at Intermot. "When you sit on the bike, the riding position is very different and you notice that straight away," Plaschka said. "The seat is higher, your knees are at a more relaxed angle and you are more over the front and there are new Dunlop Roadsport 2 tyres, too. "I enjoy the riding positon. It’s a sporty, fun-riding bike for short trips. A modern-day retro with its own character and as you get more familiar with it the more you can trust it and push it." Whether this latest bike is capable of achieving the same cult status remains to be seen, however initial public response has been overarchingly positive, with fans of the original machine finally getting the modern adaptation they wanted. The first Katana stayed in production for just three years in the early 80s, but made a big impact. 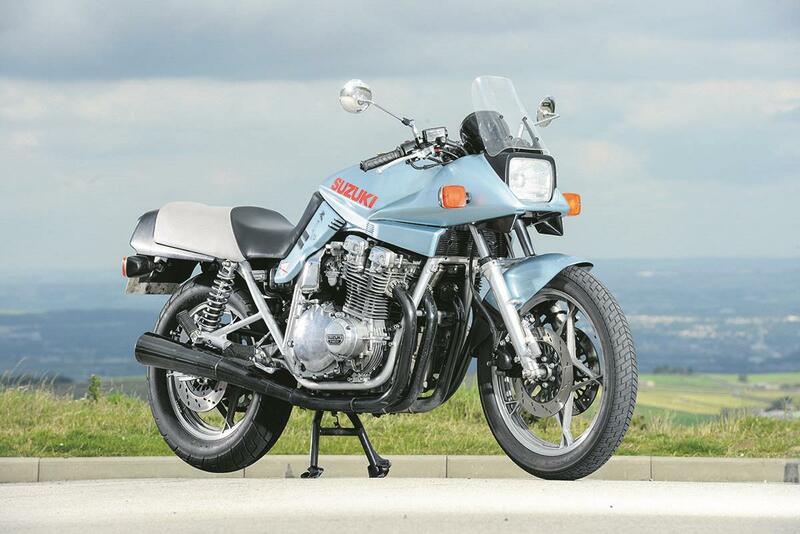 With its abstract, pointy-nose styling and a claim of being the fastest production bike in the world at the time, the 150mph Katana stamped its mark in the two-wheeled history books with a commanding thud. Released in 1981, the first iteration of the bike was the GSX1000SD, which was quickly followed by the bigger GSX1100SD the following year. The bike sold in its thousands, however was replaced in 1984 by the more conventional looking, bulky GSX1100EFE and the GSX-R750, confining the Katana to the history books – until now. It was this bold styling and headline performance that inspired Rodolfo Frascoli to design the new machine. 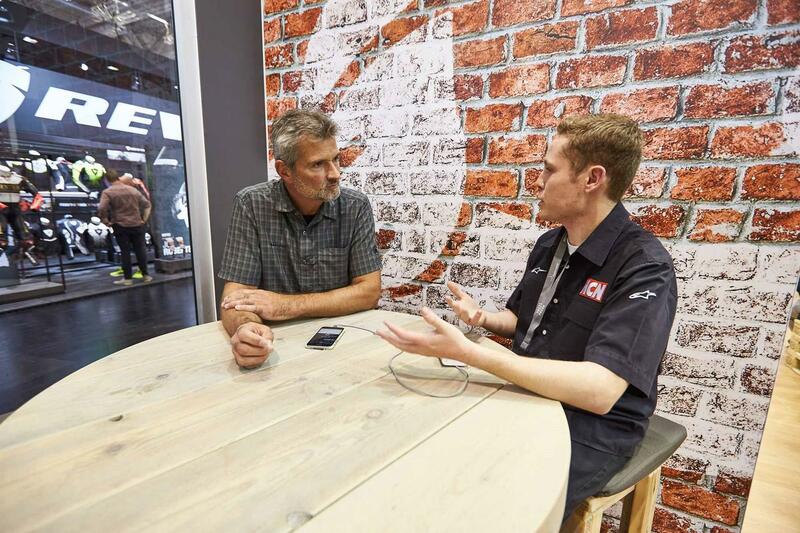 MCN caught up with him after the launch press conference at Intermot to discuss his passion for the radical Kat. "My first Katana design appeared at the Milan fair in 2017. It was my dream to work on the Katana and when I was younger I was really attracted to that bike because it was a revolution," Frascoli said. 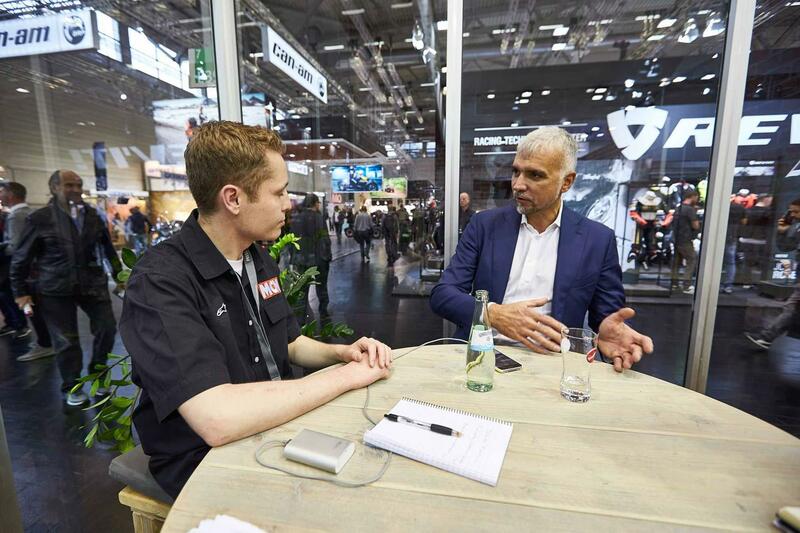 "It was a strong innovation compared to the bikes of the time and at that time I remember bikes being pretty conventional in terms of parts. They had similar tanks, body panels and seats and the rider sat on the bike in an upright position. "They were pretty boring and I like exciting stuff and I like the future. I was young, but I already had the attitude to design and had been creating bikes since I was 14-years-old. When I had the opportunity to meet with Suzuki three-years-ago, I proposed a concept Katana and they were so enthusiastic that the mission started there." Fast-forward three decades from that first Katana and the world has gone cuckoo for modern classics, with almost every major manufacturer adding retro bikes to their line-up. Keen to cash in on the buzz, Suzuki invested heavily in their Vintage Parts project, allowing classic Suzuki owners to once again purchase official parts for their beloved carbureted treasures. 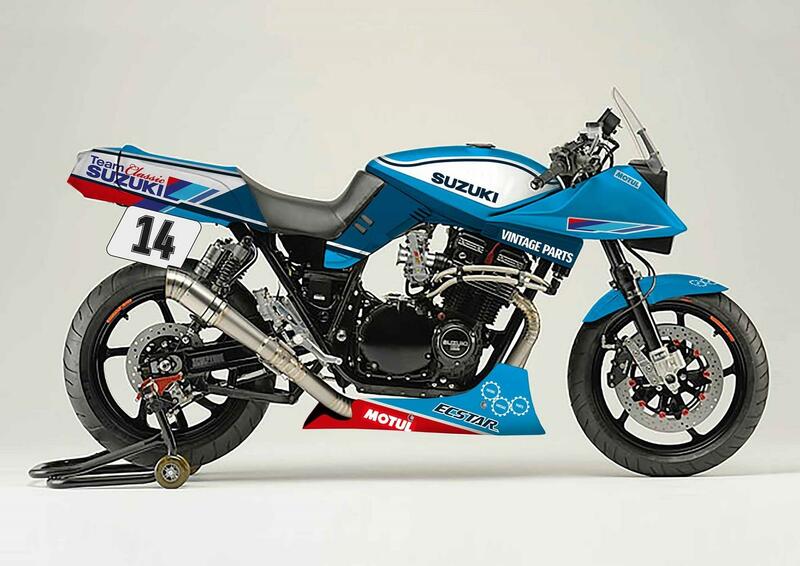 Part of that scheme has also included the Team Classic Suzuki Katana Endurance Bike, which first appeared competitively in 2017 at a rainy Donington Park for the Endurance Legends racing weekend. The bike was piloted by former professional racers Steve Parrish and James Whitham alongside MCN’s own Chief Road Tester Michael Neeves as part of the headline four-hour endurance race. Unfortunately, Whitham crashed out on the first lap of the race and was unable to start again. Since then, the team has also competed in a variety of other races, including at Spa-Francorchamps with Guy Martin and Peter Boast and a four hour night race at Aragon in Spain – again featuring MCN’s Michael Neeves. All of this competition has helped whet our appetite for the 2019 Katana and we can’t wait to ride it. MCN will bring you all of the information from its launch and subsequent road tests on our grueling 250 route in the early stages of next year.